SPIRAL is a FP7 funded project that studies “science-policy interfaces” between biodiversity research and policy to draw lessons and improve the conservation and sustainable use of biodiversity. In case you have not yet decided what to read this Summer, we have a couple of interesting reports for you originating from this project. Interactions between biodiversity-related science and policy-making are still poorly understood. To enrich decision-making and research on biodiversity it is therefore necessary to examine how processes of exchange and construction of knowledge between scientists, policy-makers and other actors or stakeholders work. 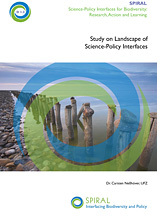 As a first step towards the understanding of such science-policy interfaces, it is necessary to find out which science-policy interfaces exist and how they can be distinguished. 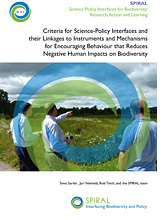 The aim of this report is to synthesise work done in SPIRAL Work Package 3 to develop criteria for describing and assessing science-policy interfaces and their linkages to instruments and mechanisms for encouraging behaviour that reduces negative human impacts on biodiversity. The work included a literature review, two workshops with stakeholders, and interviews of eight experts with experience ofbiodiversity science-policy interfaces. The resulting set of 18 criteria developed are presented in this report.